Portuguese printer; born in Lisbon, where he was engaged as foreman in the printing-house of Eliezer Toledano. Driven out of Portugal at an advanced age, he settled in Salonica, and about 1515 set up the first Hebrew printing press established in that city, using in part the type which he had taken with him from Lisbon. One of the first works printed was the "'En Ya'aḳob" of Jacob ibn Ḥabib, whom Gedaliah esteemed highly. In 1522 he printed Isaac Arama's "'Aḳedat Yiẓḥaḳ." 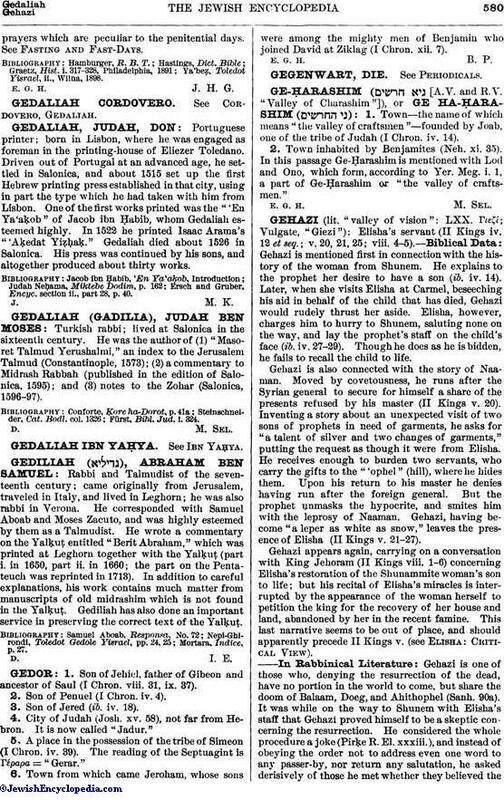 Gedaliah died about 1526 in Salonica. His press was continued by his sons, and altogether produced about thirty works. Ersch and Gruber, Encyc. section ii., part 28, p. 40.